other name:- Beetham Force ? 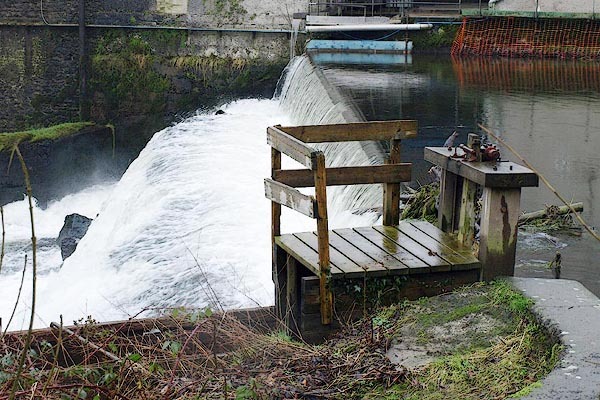 The waterfall is now part of the weir for the mill pond for Heron Corn Mill. In the river Betha is one of the two catadupae or waterfalls mentioned by Mr. Camden. The rock which crosses the bed of the river 66 feet in breadth is 16 feet perpendicular, down which the water falls with a mighty noise. But in the summer season the whole of the river is employed in carrying two corn mills. The phaenomenon of Levens and Betham fall is thus to be explained. When that which is to the north sounds more loud and clear, the inhabitants look for sour weather; when that to the south, for rain; the south-west winds blowing from the sea bring the vapors with them, and from the north-east have the contrary effect. The label is downstream by the estuary. ... 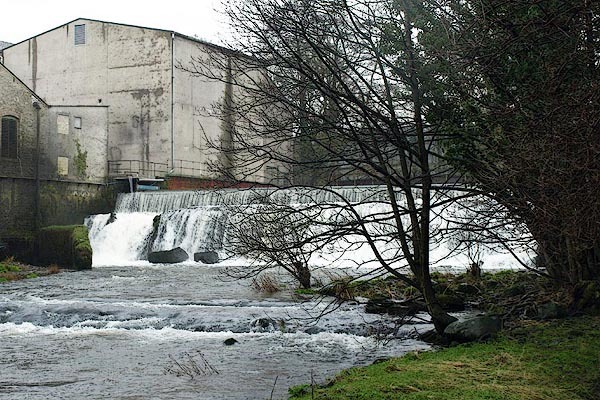 There are also neere Kendale in the River Can, two Catadupa or Waterfals, where the waters descend with such a forcible downefall, that it compels a mightie noyse to be heard, which the neighbour Inhabitants make such use of, as they stand them in as good stead as Prognostications: for when that which standeth North from them soundeth more cleare, and with a louder eccho in their eares, they certainly looke for faire weather to follow: But when that on the South do the like, they expect foggy mists and showers of raine.